Aerodynamicists use wind tunnels to test models of proposed aircraft and engine components. During a test, the model is placed in the test section of the tunnel and air is made to flow past the model. In some wind tunnel tests, the aerodynamic forces on the model are measured. In some wind tunnel tests, the model is instrumented to provide diagnostic information about the flow of air around the model. In some wind tunnel tests, flow visualization techniques are used to provide diagnostic information about the flow around the model. 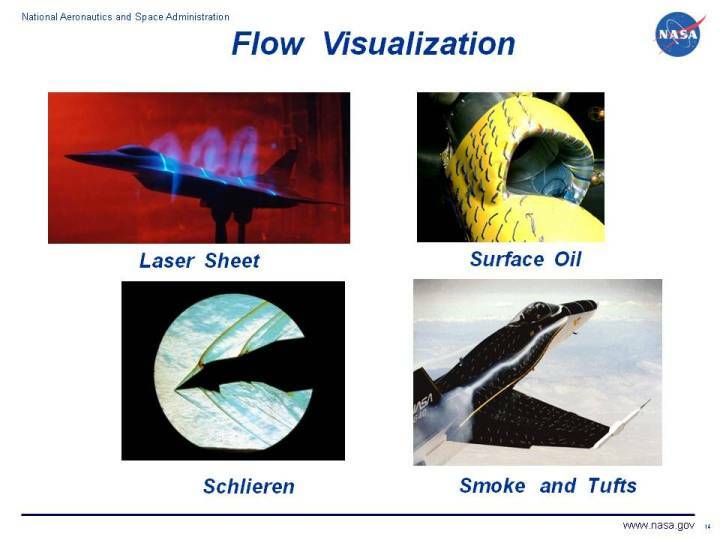 The figure shows five flow visualization techniques that are used in wind tunnel testing; smoke, tufts, laser sheet, surface oil flow , and schlieren photography. Tufts and surface oil flow are used to provide information about the state of the boundary layer on the surface, particularly to detect flow separation and re-attachment. Boundary layer separation is a souce of drag and the cause of wing stalls. Some engineers try to determine where the external flow is going by studying the flow along the surface. A more accurate way to visualize free stream flow is to use smoke or laser sheets. The assumption is made that the smoke or seed particles for the laser move exactly with the flow and therefore gives some indication of how the flow moves around the model. The schlieren photographic technique is used for flows with a large change in fluid density. The technique relies on the bending of light rays across density gradients to produce a photographic image that locates the gradients. Wind tunnel engineers use the schlieren system to locate shock waves, which are very thin regions with high density gradients. The system can also be used to study combustion. You can investigate some wind tunnel visualization techniques by using our interactive tunnel testing applet.